As you can see we have a house guest. This is Ella Phlint. Some of you know her already. She comes to us via Melli, her permanent guardian. Ella travels about the world meeting Melli’s blogging friends in person since Melli can’t. Ella stayed with Amoeba and me in Hawaii. She stayed with Thom in Hawaii. And she visited Susan in Ireland. Because she knew most of us already, I asked Melli if Ella could come to our blogger gathering. Ella arrived about the same time the new love seat was being delivered. She climbed up, sat down in the middle of it and declared it hers. I tried to explain that we didn’t buy it for her, but she can’t think of any other reason it would have arrived the same time she did. Coincidence apparently isn’t a word elephants understand. The couch looks just like the love seat except, of course, it’s a little bit bigger. Since it is bigger, Ella has said Amoeba and I may share it. I told her that when Thom, Susan [et al], and Sylvia arrive on the 14th she will be sharing, too. Ella said that she will share with Susan and the kids, but Thom is going to have to find somewhere else to sit. She has not yet met Sylvia, but Ella says if Sylvia is as nice as Susan, she will share with her, too. ← iPhone Addicts: Get The App That Pays You to Use It! Too cute haha! I’ve seen Ella before 🙂 Can’t afford the shipping cost to host her, but that’s okay, she looks quite at home over their on your love seat anyway :p Very adorable! Teresa — Ella will be in Canada next week. We are staying at The Secret Cove Resort. I like the color of your love seat! Enjoy the visit! A Republican, no less. Gigi — Ella may be an elephant, but she is stubborn enough to be a donkey. Actually Thom, I think Tilden was praising Ella. Ella will be visiting Tilden soon. it’s as plain as that! You’re both confusing me. Talk to each other. That is a lovely loveseat. I can’t wait to see your posts with Sylvia, Susan and the kids!!! Kay — I can’t wait either. It’s going to be fun! ” … champagne in one hand, a cigarette in the other, ‘Who’s in charge here? '” She starts spouting off ‘Who’s the ugly guy?’, I’ll give that phlinty pachyderm cos for concern, I will. Amoeba — Ella seems to be just a bit intimidated by you. And if Thom gives her champagne and cigarettes he’s in big trouble! Akelamalu — right now Ella is excited about Hummingbirds and spend all of her time at the window watching. Kelley — I wasn’t going to mention that. Oh, you are going to have such a party. Can’t wait to hear and see about it. Are Ella and Thom related? Nessa — Ella says no, but I’m wondering, too. Don’t be mean to that elephant or she’ll never forget it! Linda — pft. Ella has ADHD. She is a incredibly hyper and flighty for an elephant. I bet Ella is very excited to be at your house. And to meet so many bloggers in one place. It will be a blast, I´m sure! Betty — Ella has been to and spoken at a bloggers convention in Hawaii! Looks like you all are in for a good time! Love Ella’s shirt. Barbara — Ella’s shirt belies her personality! Trust us on this. I believe your elephant guest is missing in a bit of social graces. Granny Annie — not always. She had a long time and was tired and cranky. After a bit of Huckleberry Ice Cream and a nap, she was better. Mine has exactly the same color as yours. 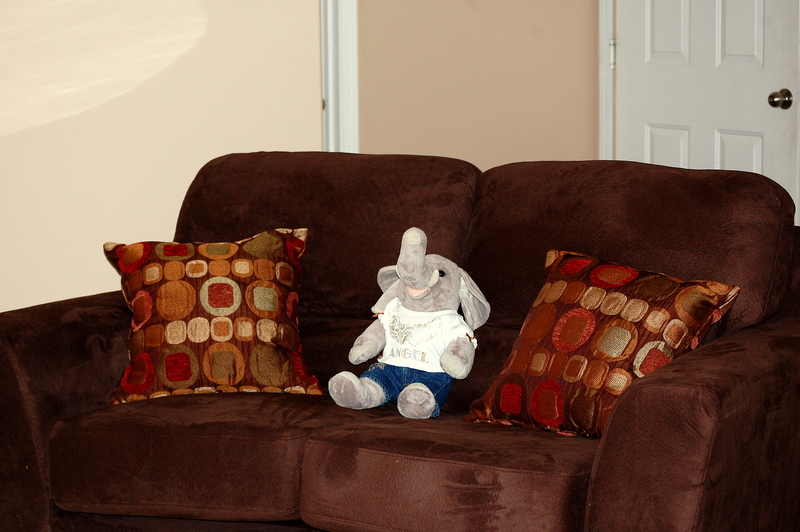 Jingle — your elephant or your couch? Jingle — I keep telling you I don’t do this stuff! Susan — we’ll put her stuff away. This house is more than big enough to do that. Susan — I am with F. Ella made her noise today while I was carrying her and I almost dropped her! It’s good to see Ella again and know she’s doing well. Can’t wait to see all the new adventures at the gathering. Carletta — I think a lot of people who aren’t coming to the gathering are looking forward to it as much as the folks who are! NOOOOOOOOO CHAMPAIGN AND CIGARETTES!!! Jeezy peezy! It took me FOREVER to get those cigarette stains off her tusks!!! (and no grape juice either…) Especially not near the LOVESEAT! I sure can’t afford to replace THAT! Oh, it’s LOVELY by the way!